This is one of those dishes I can’t make very often because I find myself eating it for breakfast, lunch & dinner for days! Bring water and oil to a boil. Add noodles and cook per package directions. In a seperate pan add your peas to boiling water and cook per package directions, about 5-7 minutes. When the noodles and peas are finished put both in a large strainer and run cold water over it for 1-2 minutes. This will help cool the noodles quickly so they don't get mushy and stick together. Once you're done running the water over them shake the strainer to remove excess water and place noodles and peas in a large bowl. 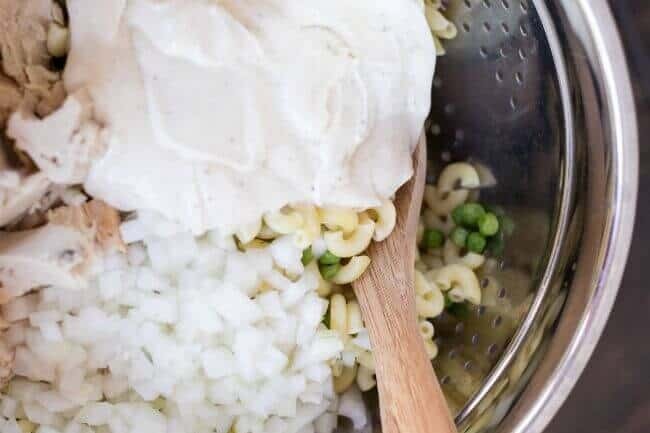 Cover the bowl with plastic wrap and place noodles and peas in the fridge for about 30 minutes to an hour, or until cold to the touch. When the noodles are cold start preparing your remaining ingredients. Chop your onion into small pieces and set aside. Open and drain water out of albacore tuna. Place on plate and cut into small bite sized pieces. 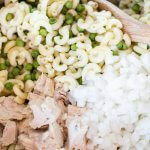 Add tuna, onions, mayonnaise, miracle whip, salt and pepper into bowl with noodles and peas. Stir all ingredients together and taste. Add more salt/pepper if needed. Please keep in mind that this is going to make 2 large bowls of tuna pasta. I would recommend cutting this recipe in half if you are not taking this pasta to an event. As this tuna pasta sits in the fridge it will tend to dry out. If this happens, add additional mayonnaise before serving! Perfect hearty meal that’s ideal for summer – Cajun Jambalaya Pasta, Yum! I use the pickle relish also…the shells taste better…I have no idea why! Could you replace the mayonnaise just for the Miracle whip instead of using both? love, love, love some cold tuna salad! 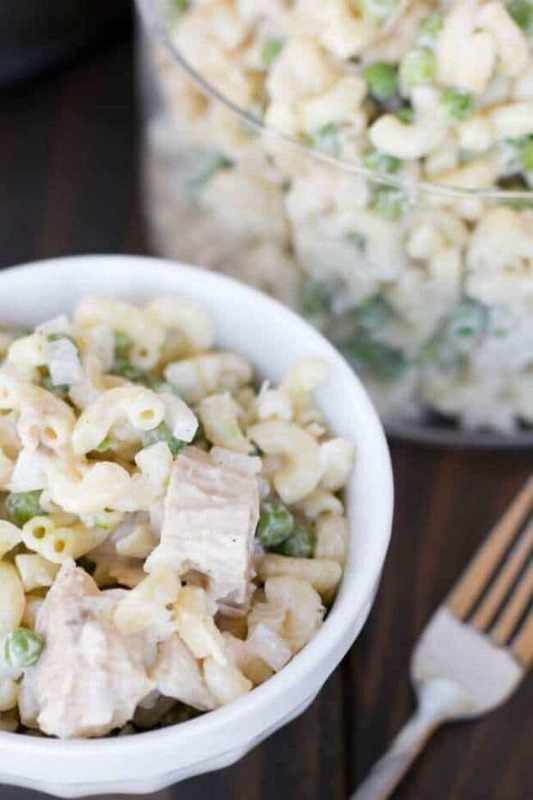 I really like to make tuna casserole, but this is perfect for summertime fun!! Thank you for this wonderful recipe. 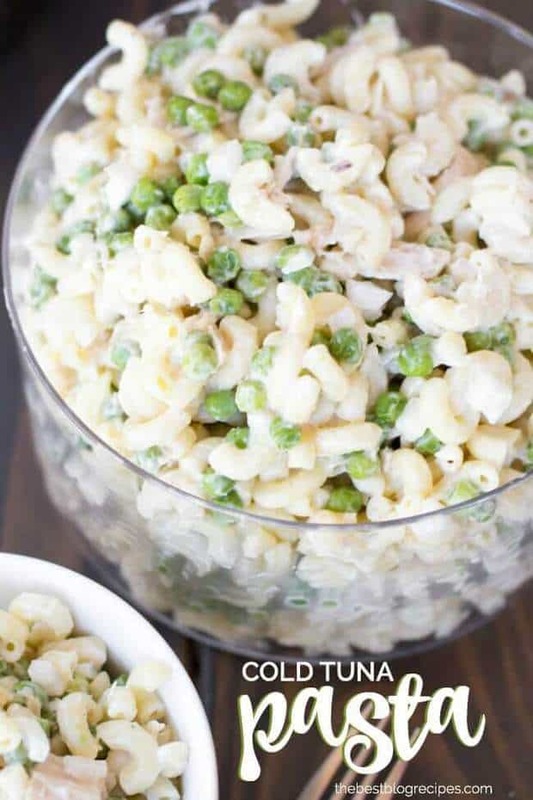 I love tuna pasta salad but I did not know of a good recipe and this one is perfect. I made the mistake of making the whole batch and I ate it literally for days. I didn’t mind at all. Can you use regular tuna? I love this salad also. Some variations we like… sometimes I use cut up cold cooked chicken instead of tuna. My family likes the “crunchiness” factor.. so I usually add cut up celery and carrots in tiny pieces. I have also added garbanzo beans; black beans or even sweet kernel corn. ( canned or frozen ) fun to experiment. When I was a kid there was a Tuna Helper Cold Tuna Pasta that you could buy at the store…it was soo good. My Mom found a copycat recipe for it…we use Onion Flakes in ours…the longer it chills the more the flavor sets in….and I am like you..I can eat it for Breakfast, lunch and supper!! Oh my goodness!! That is the recipe I am looking for!!! It was my favorite!!! So miss that Tuna Helper!! I ate it ALL the time!!! I don’t the cook the frozen peas but put them in the colander and then drain the cooked pasta over the peas. This defrosts them and Helps cool down the pasta at the same time. Your recipe looks great! 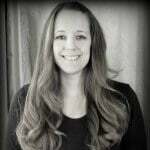 Is there a substitute for the miracle whip? It is not sold in my country. Is there another suggestion on what could i mix together to get the same texture and flavor? Miracle Whip is a lot like mayonnaise, so I think you could use that instead! Miracle Whip has a bit of sweetness. I make it as my mom taught me yrs ago..hellmans mayo , peas in can ( hate frozen peas), 2 hard boiled eggs chopped up and cucumber and tuna…i could eat it all day also!!! Dont forget diced onion..? I love classic recipes passed down from mom and grandma! So delicious! I love this type of salad, but haven’t made it in probably two years. I add a couple tablespoons of pickle relish to my dressing. It gives it just a little bit of tang. This was something I learned to make when I was growing up but we didn’t have a recipe. Thank you for reminding me of the ingredients. I, too, only use Miracle Whip. I only use Mayo for Hidden Valley Ranch Dressing. My daughter dislikes peas so I suggested celery and a red onion instead of the yellow onion. I also told her we could use shredded or tiny diced cheddar cheese. we love this salad ! I added chipotle and garlic seasoning , added a kick ! Yes – SO good! The chipotle and garlic seasoning sound like great additions as well. Thanks for the suggestion. OK love the recipe. You have olive oil in the recipe but it doesn’t tell me where to incorporate it in. Sorry Cindy, we just put a little in our water while it’s cooking. Definitely not necessary but that’s just what mama always did and how we learned. Have you ever added celery? No, but I bet that would be yummy as well! Thanks for stopping by. Quick question….what size cans of tuna do you use? I intended to use small ones, but I sent my husband to the store and he came home with 3 large cans! I had to make it before I received your REPLY….I used ALL 3 large ones and I thought it was barely enough!!!! Lol! Glad you had a chance to make it Brenda!!! Thank you for this recipe! It really is the best pasta salad I’ve ever tasted. I made a half recipe and wish I’d made the whole thing. Your comment about breakfast, lunch and dinner is right on for me. I just had it for breakfast for the second time. I used medium shells instead of elbows. I used CW petite peas frozen and did not cook them. For the half recipe I used just one can of tuna and for me it was PERFECT. Perfect. I made a full batch yesterday and took half to my son for his lunches. I just got a text telling me he has eaten NOTHING but your salad for every meal and in between since he got it yesterday. He was going to share it but now he’s not so sure about that. I started with two cans of tuna and decided, like you, it needed three. Your use of a small amount of Miracle Whip is genius, just the perfect bright note. Brava! That is so awesome Marsha! We are SO happy you came back and left a comment 🙂 It really made our day!!! SO glad your son loved it too. Instead of using so much mayonnaise, I use half milk and half mayo or Miracle Whip. 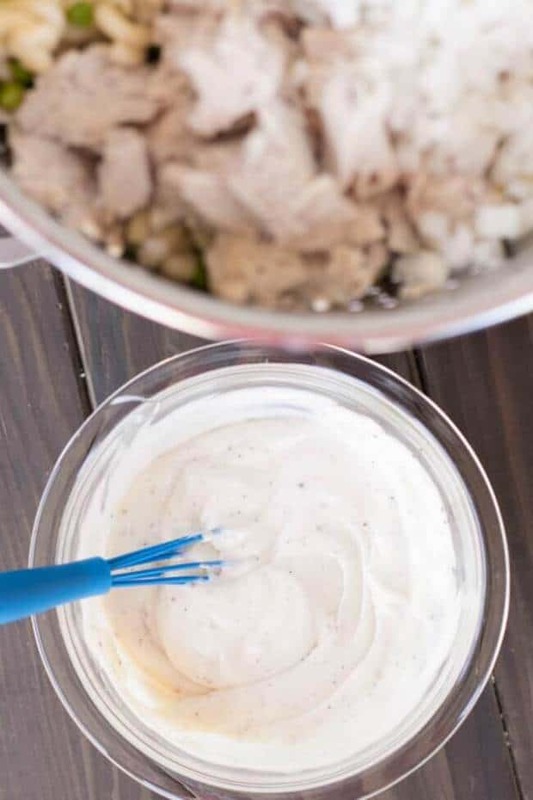 The dressing is not so thick and it doesn’t dry out as fast. If it does get a little dry, I add milk, not mayo. My husband who can tolerate creamy dressings will only eat my pasta salads because the dressing is not so thick. My mom makes this all the time but she uses all miracle whip and adds lots of celery and it never lasts long! Everyone loves it! i like tuna pasta salad. I had a tuna fish salad years ago at a party that was very good. This sounds like it, except she had used baby shell pasta and she had added some celery as well. I will be making this dish soon. I am hoping that this is the recipe that she had used. This is a great twist on a basic dish. Thanks so much for linking up to Saturday Dishes. Pinned! thanks for linking up to SAt Dishes! 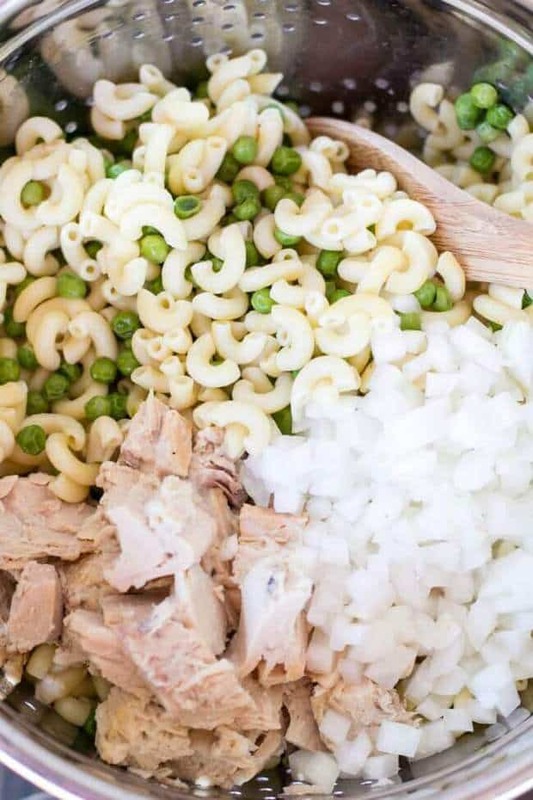 I love tuna salad and pasta salad! This is a perfect match!